Looking for a great day out that's educational, too? Inspire your budding scientist with a trip to one of these brilliant, hands-on UK science centres. If you’re looking for an educational day out that every member of the family will enjoy, you can’t beat a trip to a science centre. Subjects that often seem dry in the classroom – like forces, cells and reactions – come to life when children can get hands-on, and a family outing could inspire a real passion for science and technology. We’ve rounded up the best science-themed days out for primary school children throughout the UK. London’s Science Museum is the most famous of the UK’s science attractions, and still one of the best. Children can explore the history of space travel and take a virtual tour of the International Space Station, discover the science of climate change, find out how the body works and visit the Discovery Motion 3D cinema. There’s also a busy programme of educational shows and a brand new kids' permanent gallery, Wonderlab. If your child has been inspired by Tim Peake's ISS mission, a trip to the National Space Centre will be an unforgettable day out. There are lots of practical activities for kids to get stuck into in Tranquillity Base, including mining moon rock, controlling a spaceship and learning to spacewalk. They can find out about how space informs weather forecasting, watch an incredible 360-degree movie in the planetarium and marvel at the 42m high rocket tower, with three floors of activities exploring the space race and beyond. Exploration Drive, Leicester, LE4 5NS. Adult admission £14; child admission £11; under fives free. Formerly known as @ Bristol, We The Curious has to be one of the country’s best hands-on science centres for kids, with a constantly changing programme of events such as the Invention Lab, where they can make their own light-up badge, Good Vibrations, a stage show that explores the science of sound, and the exciting 3D planetarium show. The Live Science team are on hand to answer questions and help your child get to grips with the exhibits, and there are loads of experiments to take part in, from building with giant blocks to examining your own veins. Anchor Road, Harbourside, Bristol, BS1 5LL. Adult admission from £14.60; child admission from £9.40; under twos free. With three floors of interactive exhibits, Glasgow Science Centre features the hugely popular BodyWorks zone (if you’ve ever wanted to know more about snot, this is the place to be! ), and the new Powering the Future exhibit where children can find out how energy is generated and even launch a hydrogen powered rocket. 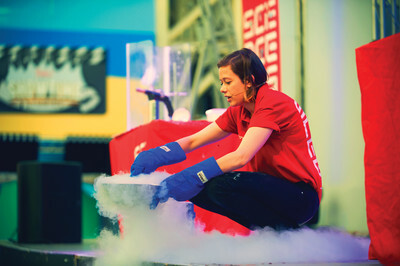 There are also all the old favourites such as plasma balls, chaos pendulums and whispering dishes, plus live shows on topics ranging from the night sky to lung dissection – not for the faint-hearted! 50 Pacific Quay, Glasgow, G51 1EA. Adult admission £10.50; child admission £8.50; under threes free. At Life, your child has the chance to be a scientist for the day. In the Experiment Zone they can meet real scientists, carry out practical experiments and take part in actual research projects taking place at local universities. The Curiosity Zone will fire your child’s imagination with tasks including building a chain reaction and composing music, while the Robot exhibition lets them get up close to some of the most famous bots from TV and the movies. There’s also a Young Explorers’ Zone, perfect for under sevens. Times Square, Newcastle upon Tyne, NE1 4EP. Adult admission £9.95; child admission £6.95; under fives free. Previously known as Satrosphere, Aberdeen Science Centre was Scotland’s first science centre and although it’s a small-scale operation, it still offers a great day out. It’s perfectly pitched for primary -school children with hands-on activities exploring simple scientific concepts. There are regular special events such as the astronaut training workshop and Little Explorers days with themes like minibeasts and the human body. The planetarium show is also well worth a watch. The Tramsheds, 179 Constitution Street, Aberdeen, AB24 5TU. Adult admission £5.75; child admission £4.50; under fours free. There’s lots to discover at Techniquest, which was originally founded by experts from Cardiff University’s science department. There are plenty of activities and experiments for children to try, covering curriculum areas such as hydraulics, water (be prepared for kids to get wet! ), mechanics and electronics, plus optical illusions, puzzles and games. There’s also a smaller Techniquest outpost – Techniquest Glyndwr – in Wrexham. Stuart Street, Cardiff, CF10 5BW. Adult admission £7.50; child admission £6; under threes free. W5 stands for who, what, where, when, why, and as its name suggests, it’s full of opportunities for your child to discover and learn. It boasts 250 interactive exhibits including the Discovery area for under eights, DO, where children can build structures, design a wind turbine and bring a robot to life, and the brilliant RoboThespian: a humanoid that children can program to sing, act and do impressions. There’s also a daily programme of live science shows and demonstrations, and children can burn off steam in Climbit – a huge multi-storey climbing structure. The Odyssey, 2 Queens Quay, Belfast, BT3 9QQ. Adult admission £8.50; child admission £6.50; under threes free. New Scientist Live is a festival of discoveries for everyone who loves science and wants to understand how it shapes our world today (and will create the world of the future). More than 120 speakers and 100 exhibitors come together in the ExCel exhibition centre in London every September to create an energy- and ideas-packed atmosphere with expert talks, interactive experiences, workshops and performances. A Standard Family Day Pass (2 adults and 2 children) is £90. Produced annually by the Science and Industry Museum, Manchester Science Festival offers an incredible range of events, from problem-solving and experimental gaming to engineering and biotechnology. Packed with family-friendly opportunities to see first-hand how cutting-edge research in science, tech and media is changing the world, the Festival is proud to be 'part laboratory, part playground' and features plenty of hands-on activities led by real-life scientists to inspire the engineers, technicians and inventors of the 21st century. The Brighton Science Festival in October half term aims to help extraordinary people show young people how to make extraordinary things. There's a full week of workshops and experiences, from watching science shows to hands-on taster sessions (fancy trying paleontology or programming? ), messy science, close encounters with members of the animal kingdom and lots more. The Big Bang Fair is an immersive, exciting combination of theatre shows, interactive workshops and exhibits and careers information from STEM professionals. Held at The NEC in Birmingham every March, the Fair aims to show children aged 7-19 the career opportunities in science, engineering and technology by bringing classroom learning to life. Weekend tickets are free to families. 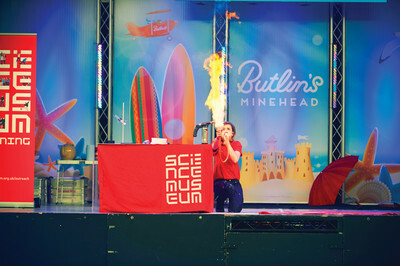 Available at Bognor Regis, Skegness and Minehead resorts, the Butlins Science Zone is open during school holiday breaks and ideal for children aged 8+. A great place for the whole family to learn about science, there's an opportunity to get hands-on with experiments developed in partnership with the Royal Institution, L’Oréal UK & Ireland, Brainiac and the National Space Centre.